Jealousy is not just a human emotion. When a human feels jealousy, the demonic can partner with that jealousy to turn it from an irritation into a lethal weapon. Cost includes 428 days of access after purchase date. This teaching explains the demonic power that functions in partnership with the soul emotion of jealousy. Arthur shows various groups of people who have jealousy for different reasons, so that you can identify the root issues that produce jealousy, and not just the surface issue of jealousy. In the Mercy Season, there is a particularly complex set of forces that produces uncommon jealousy in the church. During Communion, Arthur specifically engages with the sins of commission and the sins of omission, our sins and other people’s sins that open the door. Then he engages the demonic entity of jealousy to set you free from this devouring. Thank you for the work you did to put this together. 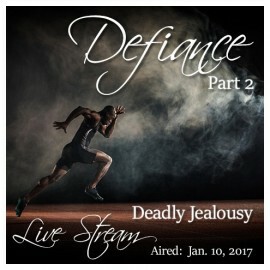 Although I had heard some of this teaching several times before and understood what jealousy could do to a person, I, personally had not been able to be free from it until honor was extended to me by Arthur when I listened to this stream. I was laughing, crying and rejoicing as I felt that thing lift off of me, I physically felt it leave! The power, presence and anointing of the Holy Spirit on this teaching is like none other that I had felt before. I had known for several years, jealousy was coming at me from several low level sources, but at the time of this teaching, I had just recently found out about one particularly vile source which had been hidden for more than three years. Until I became free of it, I did not realize how much this spirit had hindered pretty much all aspects of my life, including many physical problems which could not be explained or identified and a close relationship which was off, but I could not quite identify the problem. Being free from the jealousy spirit these last nine months has been extraordinary in that I am now walking in authority in those offices where God had placed me. As I am writing this review, the awe of God I feel once again is all over me from that experience. The experience of being set free from the spirit of jealousy, the day and the time is forever seared into my spirit, soul and body, and will be one I will always treasure and draw on. I am forever grateful for the truths in this stream and highly recommend it! Q. When is success dangerous? A. When it triggers jealousy that is demonically empowered. Fortunately, it does not have to be this way. This video will help set you free from the past and position you for the future. You can't stop jealousy. You CAN stop it from landing on you.